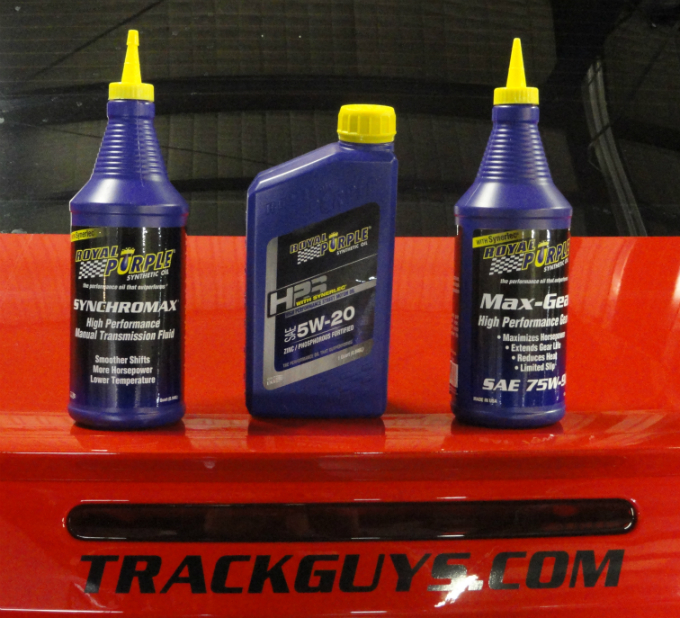 We’ve all read the claims and “heard it from a buddy” regarding the power gains provided by synthetic lubricants. But rarely to we have the opportunity to conduct our own tests with the before and after data being validated on an chassis dyno. Another rarity is me purchasing a brand new vehicle. But such was the case in June of 2011 when I purchased a new Mustang GT with the high-tech 32-valve 5.0L “Coyote” V8 engine, six-speed manual transmission and equipped with 3.73:1 rear gears. My goals in purchasing this vehicle are, 1) have a reliable, street-legal, fun-to-drive Mustang for my everyday enjoyment, 2) ONLY make modifications that are going to make verifiable performance and safety improvements, and 3) build it into a car that I can enjoy on the track without sacrificing goals 1 and 2. With those goals in mind, I drove the car in completely stock condition from June of 2011 to March of 2012 before I decided I had enough “baseline data” on the car and that this is in fact that car I want to move forward with goals 2 and 3 as outlined above. The first modification I wanted to make was to the Mustang’s internal lubrication sources – meaning the engine, transmission and rear differential oils. Because the car was still in stock condition (just some excessive wear on the tires and brake pads…) I thought this would be a great time to “see for myself” if there were any performance gains to be made by switching the car out to synthetic lubricants. I’d gotten to know the folks at Royal Purple Performance Lubricants during my time as Marketing Director at Accessible Technologies, Inc (ProCharger). Their products have an excellent reputation in the performance aftermarket and they are active supporters of a wide range of professional and grassroots motorsports – so I figured their products would be a fair representation of products that our Track Guys students and instructors would have access to for their own vehicles. Because I wanted to have quantifiable data regarding my switch to 100% synthetic lubricants, I contacted the folks at MC Racing in Overland Park, KS to schedule some dyno time and to physically switch the car over from its OE lubricants to the Royal Purple products. The process would be as this: warm the car up, conduct a couple of baseline dyno pull on MC Racing’s Dynojet rear-wheel dyno, drain all the OE fluids and then replace them with the Royal Purple products. Once the fluids were replaced, we’d then put the car back on the dyno, warm up all the lubricants and then make a couple more dyno hits to see if in fact there were any horsepower and torque gains. Once the car was strapped onto the dyno, the MC Racing guys got the car up to operating temperature by running it unloaded on dyno. Once it was up to temp, two back-to-back pulls were made. At the time of these test, the car had 12,000 street and track miles on it and it was still 100% stock, including the exhaust system, air intake/filter and OE-spec lubrication. The two back-to-back dyno pulls gave us these numbers. That’s an average of 380.175 rear-wheel horsepower and 349.63 ft-lbs of torque. 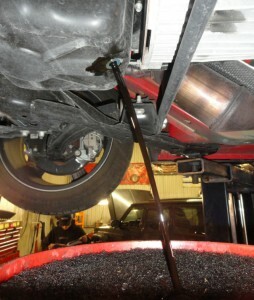 With the car off the dyno and on the lift, MC technicians began by removing the factory fluids. With the Mustang drained of its lifeblood, the red steed then began to receive its transfusion of Royal Purple’s trademark purple-tinted lubricants. 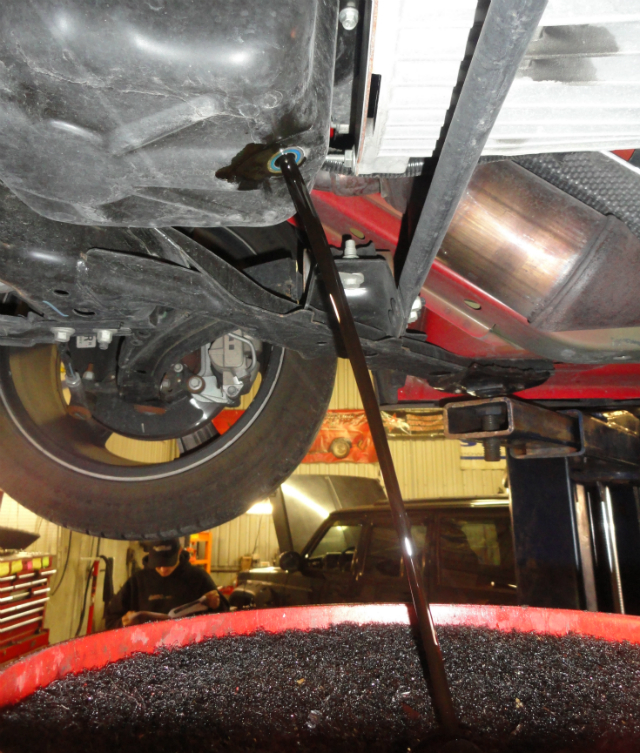 The process is very straight forward and is greatly simplified if you have access to a vehicle lift and an oil transfer pump. With the rear gear, transmission and engine oil all filled with the Royal Purple products, it was back on the dyno for a brief warm up run to get all the fluids up to operating temperature before repeating our two back-to-back dyno pulls. I’ll let the photograph of the computer’s dyno display speak for itself. 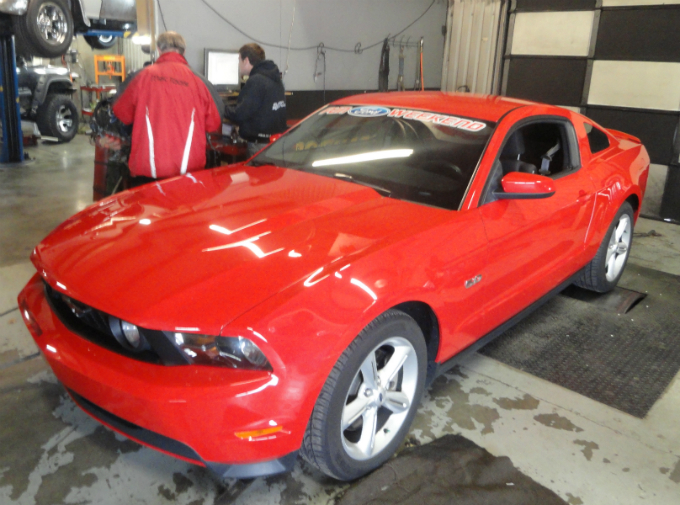 Run Files 4 and 5 are after switching to the Royal Purple synthetic lubricants in a completely stock 2011 Mustang GT, six-speed manual and 3.73:1 rear gears. Runs Files 2 and 3 were with OE-spec lubricants. 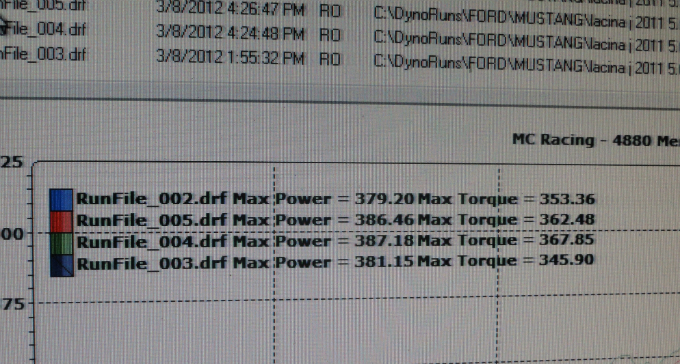 The two pulls averaged out to 386.82 rwhp and 365.165 ft-lbs of torque. 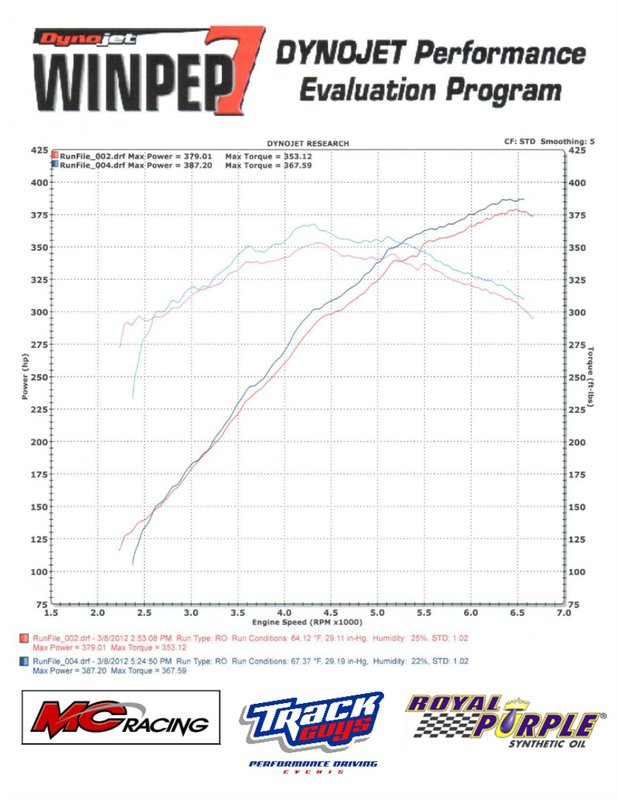 Comparing to before and after numbers, that’s an average increase of 6.645 rwhp and 15.535 ft-lbs of torque simply by changing over to the Royal Purple products. Keep in mind, the Royal Purple products had just been added to the engine, transmission and rear axle and brought up to temperature. I suspect we would see even larger increases after some additional miles of use and run in. I don’t know of may other modifications that I could have made to my 2011 Mustang GT that would have resulted in an immediate increase of 6.6 rear-wheel horsepower and more than 15 ft-lbs of torque. I look at it this way: my car needs these these lubricants, so why not use products that will provide you with documented gains in horsepower and torque? 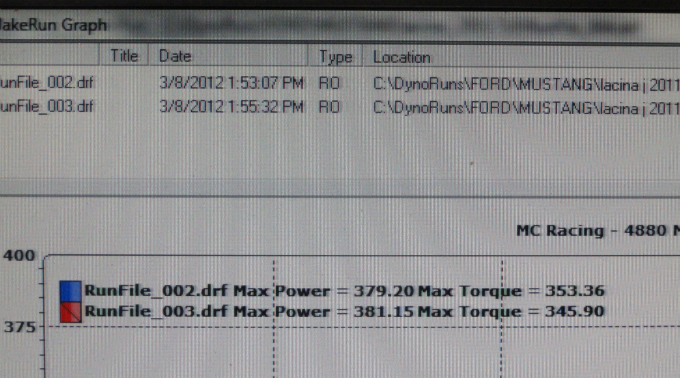 And in my car, the Royal Purple products did just that and I’ve got the dyno results to prove it. It’s a no brainer in my book. For me and my performance investment, these kinds of results from the Royal Purple Performance Lubricants are nothing short of amazing. Thanks to Royal Purple and MC Racing for your support on this project. Kawasaki 650R Ninja. Thank you.